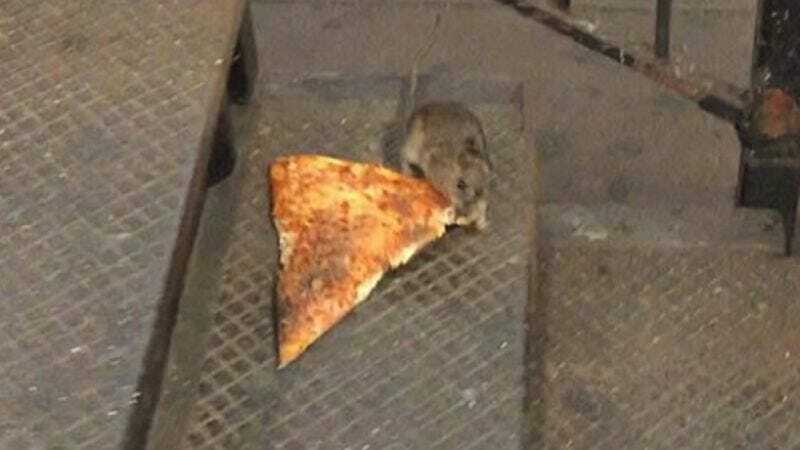 The internet was absolutely paralyzed with glee yesterday after a video emerged of a semi-large rat trying to carry a piece of pizza down a set of stairs into the New York City subway. And while most people are content enough just to watch the 15-second clip on a loop, thinking about that little rat’s strength and perseverance, others, like the fine people at The Daily Dot, want to know who actually shot that video. What human could withstand that sort of task without dashing away in either disgust or awe? Turns out the rat spotter was a guy named Matt Little, who sat down with The Daily Dot to talk about where the action went down, where how discriminating he thinks Pizza Rat’s tastes are, and if he thinks he just saw part of the origin story behind the Teenage Mutant Ninja Turtles. The whole interview is over at The Daily Dot, and should help put Pizza Rat in a whole new context for any somewhat optimistic reader.